Becca gets hit by Tropic Thunder in this hilarious parody of everything film. Take a glance at the poster for a second. Looks like a stereotypical, tedious run-of-the-mill action movie, right? True, you’d be almost completely correct, but only almost. The movie is in fact a movie WITHIN a movie. With me so far? Okay. A group of high-maintenance actors are plunged deep in the jungle to make a high-budget film called ‘Tropic Thunder’, based on the experiences of a Vietnam War hero, who unfortunately lost his hands in battle. But when their director (Steve Coogan) gets blown up by a mine, the penny slowly begins to drop that maybe, just maybe, making the film is the least of their worries. There’s Tugg Speedman (Ben Stiller), a Sylvester Stallone-like action man who cannot cry on command, Jeff Portnoy (Jack Black), famous for playing an entire family of fat people (think Eddie Murphy in The Nutty Professor) and Kirk Lazarus (Robert Downey Jr.), an Australian who immerses himself in his roles so much, he undergoes a major operation that turns him black, especially for his part in ‘Tropic Thunder’. So what makes this film so great? It’s such a blatant guy film, what with all the explosions, filthy language and the distinct lack of female characters, I often wonder how it is so many people – women included – grin when it is brought up. Personally, I think it is because the entire film is essentially a parody of the film industry. The lifestyles, the product placement, even the fake trailers at the beginning hit it spot-on, particularly the ones staring Stiller/Speedman. They address the habitually ridiculous absurdity of action sequels…and he’s made five of them. Look out for a rather unorthodox cameo from Tobey Maguire in Kirk Lazarus’ film, ‘Satan’s Abbey’. I probably should talk about Ben Stiller first, as he is the main character, but to be frank, he is the same character Stiller is so good at portraying (i.e. the moronic guy who doesn’t really know how much of a moron he is), so I shall move onto Robert Downey Jr.’s role. The man got nominated for many awards for it, and you can see why. When he’s not wearing an afro etc. he’s got blonde hair, incredibly startling blue eyes and an Australian accent, but he steals the show as “the dude, playing the dude, disguised as another dude” (a quote which has yet to lose its comic effect, like most of his lines), and proves how much of a method actor he is. This makes me wonder if the same can be said for Tom Cruise. Yup, he has a role in Tropic Thunder as well, don’t you know. He plays Len Grossman, the big cheese behind Tugg Speedman’s career – honestly, just look at those pit-stains! This was an unexpected move from Cruise, as we are more accustomed to him playing Ethan Hunt, rather than a balding, overweight dude who has enough power to make strangers punch people in the face for him, likes a nice dance to the odd expletive-ridden rap song (case in point: the end credits), and swears like a drunk sailor. It’s hard to tell if this is him flexing his acting muscles, or just messing around; probably a bit of both. So, Tropic Thunder is not your standard action-comedy film, with an incredibly un-PC, tongue-in-cheek look at the action industry that has been a long while coming. This pretty little film flew under the radar a bit in this country and it certainly wasn’t shown for long at the local multiplex (if at all, I can’t remember). Maybe the basis for the film didn’t fit too with British movie goers, maybe it was a bit too exotic for a mainstream audience. It certainly doesn’t fit into the usual pop corn movie type. However don’t think that this film is too difficult – this is a unique film and it is worth a view. Beasts of the Southern Wild is a meditation on the life of a little girl called Hushpuppy (played by Quvenzhane Wallis) and her wonder in a world set in the American South. Hushpuppy’s life is shown through a world of play and the film spends a lot of time portraying this world and as it does so adds to the film’s character. A large part of Hushpuppy’s world is spent with her father, Wink, (played by Dwight Henry) and how their relationship plays out, the ups and the downs, is the main core of the film. The direction of the film gives that relationship time to breathe without having to resort to normal film contrivances needed by plot driven movies. Also important to the film is a sense of place, and that is captured by the town called The Bathtub, which is a colourful setting filled with characters. The Bathtub is a frontier place where people live in shanty towns and are separated from the more civilised world by a large levee. This adds to the mystery of the place as a never world distinct from the wider world in general and it has an almost supernatural feel of place, yet at the same time feels like a real location. Beasts of the Southern Wild has a kind of rambling tone, sometimes poetic and shot in a naturalist kind of way, which uses a shaky hand-held kind of shot, with a moving camera. This aims to show the world of Hushpuppy as a childish one, rather than one with fixed certainty, a Hollywood certainty. It does succeed in this and the film does feel realistic with the focus being on incidental things, details that a child would look at. The film moves at a gentle relaxed place reflecting the world around it, for example animals such as the pigs and chickens are given a lot of screen time as much as many people as they catch the child’s imagination. Permeating the film is a narrative from Hushpuppy that reflects her innocent world and though it offers nothing to the plot, adds to the ambience of her dream like world. Plot wise the film is fairly simplistic the events just happen in the background. The flooding of the Bathtub I think is meant to be a reflection on New Orleans and hurricane Katrina, with the government interfering in the self sufficiency of the natives and their ability to clean up themselves. 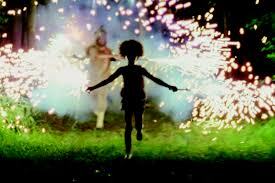 The acting is very good especially Quvenzhane Wallis who fits into the role extremely well. The ensemble cast is good and all give natural performances, they don’t just act they just are. The film’s structure allows the actors to fill out their roles. Though this is a good film, it does lacks universal appeal, in that it won’t be for everyone like a true classic would. the fairly weak plot and a lack of action are a sticking point. For fans of action or moving plots this is a film to probably miss. However those who want to see a unique vision of the world put to film, who can handle the gentle plodding in places then this film is worth seeing.